Managers and business owners can use several tools and techniques to assess the performance of remote teams, both individually and collectively. Here are some tips for creating a remote assessment plan that is effective and thorough. I learned a few things in the process of bootstrapping our business. Here are some tips for launching your business idea with little or no cash. While customers should always feel like they are right, you can’t let every customer’s whim dictate how your business operates. I’ve been lucky enough to have a number of great mentors throughout my years in business. Through these experiences, I’ve learned that there are few non-negotiable qualities that every business mentor should have. "We interviewed Simon to learn how he became a successful businessman, what strategies he uses to build his business, and how he invests in startups and why he does that." Here are five expenses that, if not initially included, can demolish your carefully-crafted startup budget. While a good leader will always solicit and consider input from the team, there are also times when a decision needs to be made quickly and firmly without outside influence. So, how does a leader know when it’s best to crowdsource a decision and when to wield executive power? Being able to scale is an integral part of continued growth and profit for your eCommerce business, and it’s really a simple concept: As the demands on your business increase — i.e. more customers start ordering your product — your business has to have operations and processes in place to handle that increased demand. Getting bigger almost always means getting better. Except for when it doesn’t. Employers should understand why millennials prefer this type of work arrangement. By better understanding the workforce, your startup can make more specific, detailed work arrangements that will not only attract new millennial talent but also help to retain existing employees. There are several steps that need to be taken before you delve into the nitty-gritty of writing your actual business plan. This process—preparing your business idea to be shaped into a plan—can be overwhelming, but there are a few tips that will make it easier. In trying to create the most useful guides and resources possible, I’ve learned a lot about the online educational opportunities in this industry. If you’re an e-commerce professional, or looking to become one, here are some of the courses I recommend. Use these tips to avoid overwhelm and maintain a healthy professional balance, even as your secondary project grows in scope. Recently I had the opportunity to interview Simon Slade from SaleHoo for the ongoing series: CEOs Share Leadership Strategies To Improve Your Company’s Culture. Despite their growing popularity, remote teams still suffer from some major misconceptions among non-telecommuters and even many executives and managers who haven’t embraced the remote work trend. Here are some of the common myths about remote work and how we’ve found them to be untrue. Employees who feel cared for and challenged will be more productive and provide a jolt of fresh energy to the company. Here are a few ways to make your employees feel that way right now. One of the most important stages in any entrepreneur's career is also one of the most exciting: shifting from the 9-5 grind to pursue your startup business full-time. This shift, while thrilling, is full of challenges. Whether you are a writer, an artist, a business owner or something else entirely, these strategies are sure to help get you out of an inspiration rut. Amazon can work great as an e-commerce platform for some, but for others, it might not be the best choice. The way your business discovers and interviews new talent needs to be modern, efficient and effective. Here are some signs that your current hiring process could use a little TLC. There is no shortage of advice on how to go about setting and achieving your goals, but identifying your goals can be a challenge, too. These questions will help you outline exactly what you want your company to achieve in the coming year. When you have an invaluable group of excellent employees, you have to find a way to make them all happy. Here are the three most important steps to take when co-workers can’t co-work. Many people fail to reach their goals because they simply forget to work towards them. Here are three effective ways to hold yourself accountable for your progress. Here are three ways journaling can be a key to success — and how to get started. If you’re just starting out in the world of online stores, here are some common traps and ways to protect yourself from them. Your response to negative comments on social media, if handled with the proper care and technique, can actually leave your business’s reputation shinier than before. Here’s how. The holidays can be a difficult time of balance for business owners, no matter how large or small your company. Here are some tips for navigating vacation time for all employees while keeping your customers happy. Simon Slade identifies four pieces of common advice that all business owners should be wary of. To understand how to set the right goals, you have to understand why this process is important and how to avoid bad goal-setting habits. Your Business Failed, What Next? Failure is not fun, but it’s also an important part of life as an entrepreneur. Here are some tips for getting back on your feet after a business idea flops. Providing constructive criticism can be challenging. And it becomes even more difficult when you are expected to provide that criticism to a remote employee. FitSmallBusiness listed SaleHoo as one of the best ecommerce blogs of 2017! My company, SaleHoo, has a telecommuting staff that is based all over the world, and going remote was one of the best decisions I’ve ever made. One of the best ways to protect a new business from failure is to know exactly what might cause failure and defend your business against it. Sacrifices are important to success. But figuring out what to sacrifice and when is not a simple equation. Here are some tips for ensuring your company’s testimonials live up to their fullest marketing potential. One of the most effective ways to support a new business is to prepare yourself — and those around you — for which responsibilities will have to take the backseat. So many businesses miss the chance to gain customer loyalty because they don’t provide enough information—or they provide the wrong kind of information—on their website’s About page. These six tips will help you take advantage of this simple marketing platform and endear yourself to customers. One of the fastest routes to success is to foster a rich connection between company and customer. Here are six ways to do just that. Simon Slade, CEO and Co-founder of SaleHoo, has found the perfect way to unite his remote team: give them a lavish perk. You’ll receive plenty of well-intentioned advice, and be reminded of some horror stories. But don’t believe everything you hear, says Simon Slade. Simon Slade shares his five suggestions for improving your performance as a business manager. Dropshipping can be a very efficient strategy for online retailers, but there are also complications to consider when setting up a dropshipping arrangement for your business. Weigh these pros and cons to decide whether this model is for you. Simon Slade, CEO of SaleHoo, offers these three metrics he believes to be the most important for growing his businesses. Here’s how business owners and CEOs can set perfectly balanced goals that will propel their company into success. Often, content creators have trouble identifying whether their content serves their audiences or if they’ve gone off on an irrelevant, self-serving tangent. Answering these questions will help you find out if your content works and what to do if it doesn’t. “...if you're trying to relax on vacation, lounging by the pool or sunning on the beach, try to pick a spot without Wi-Fi so you're not tempted to work," said Simon Slade, CEO and co-founder of SaleHoo. A poorly executed content marketing strategy is actually worse than none at all. Here are five ways to immediately improve your content marketing strategy. It’s important that business owners recognize the hiring process for remote workers is entirely different from that of in-office employees. By becoming a more discerning employer, you will have a more successful remote staff and the company will thrive as a result. When hiring remotely, you broaden your talent pool in a way that can be hugely beneficial for your company, but you are also required to be much more selective and careful in the hiring process. You should constantly strive to achieve thought leadership because of the many benefits. Here are five steps to take in your pursuit of influence. Here are four less talked-about, but equally important, skills that all business owners should cultivate. Staff satisfaction is an integral part of any business’s success because there is a direct correlation between happy employees and happy customers. Here are some creative ways to increase staff satisfaction at your company. #12. Grow your social media following by targeting your competitors’ audiences. UGC shapes the modern internet experience and your business can — and should — be part of that experience. All in all, self-scheduling has been a success for my company. It could be a success at your company, too. Here are some tips for making it work. Higher productivity means you can get more accomplished in the time that you have and also have more time to spend doing the things that you love. If that sounds good, here are some of my recommendations. Nothing telegraphs how much you trust your employees than the freedom to set their own hours. And that's exactly what I do in my own company. There are a few qualities and behaviors that are major sellers for me and many other business owners. Read on to find out what would make me – and probably most other CEOs – hire you. Just a few tips and tools can make your keyword research process more effective and ensure you get the best return on your investment. Wondering what blogging tools the experts like to use? I recently contacted 22 experts and got their takes on what the best blogging tools on the web are. Soliciting quality guest posts for your small business website can solidify your reputation, expand your sphere of influence, and increase revenue. Here is how to do it. Sometimes, the easiest part of email marketing is getting the subscribers on your list. But what happens next? The ultimate purpose of your website is to make you money, and that means you have to turn your visitors into paying customers. You can do it with these 6 tips. You want your website to have good rankings and authority, and the way to get it is by creating backlinks. These three tips for link building will help you get the best backlinks for your site while staying on Google’s good side. These eight tips will help your website appear professional, inside and out. These tools can help you simplify and organize your internet marketing strategies, so use the resources available to you to improve your campaigns and get better results. To write a successful newsletter — i.e., one that will get you a hefty return on your investment — it’s important to know exactly what makes up a newsletter and how those parts work together. Done properly, affiliate marketing can mean exponential growth of your online marketing efforts. Sound good? Here’s how to do it. There is nothing worse than knowing you have to create content to be successful, but having zero inspiration. These tips will help you avoid that by stimulating new ideas for your online content and offering some alternative solutions to the content creation grind. It’s hard to come up with consistently great ideas and see them through. One thing that makes it much easier? A content marketing strategy. Looking to tap into the video marketing realm, but not sure where to start? This guide is for you. The process of finding, hiring and training an independent contractor can seem daunting, but it can also be hugely rewarding. Follow these 6 steps to make sure you get it right the first time. According to Simon Slade, CEO and co-founder of wholesale supplier directory SaleHoo, the key to optimizing the delivery of training to gig economy workers is to build a detailed wiki that documents how to perform business tasks. Is a Remote Workforce Good for Your Business? Shaping a remote workforce to meet your business’s needs will take time and effort, but it’s possible. There are resources that can help you reclaim your time. If you need help creating solid, error-free content that doesn’t take all day, these tools are for you. Video is a powerful medium that instantly personalizes your content and stimulates your viewers visually and emotionally. Here’s how to film, edit and promote a spectacular video for your website. “If you’re just starting a company, it’s unlikely you’ll achieve the name recognition of big brands, such as Apple or Walmart, so a descriptive company name helps potential customers more quickly understand your purpose,” says Simon Slade, co-founder and CEO of SaleHoo. AffiloTools, when linked with your Google Analytics account, can show you how long visitors spend on each page, in addition to the number of views and the exit rate. This information will allow you to make more productive improvements and understand which formats and designs are most appealing to visitors. Digital marketing is ever-changing and quickly adapts itself to new technology, new attitudes and new behaviours. Here are four digital marketing strategies to keep you relevant. These time saving tools continue to be integral to my success as the owner of three businesses. If you find yourself wishing for more hours in the day, these tools will help you save time and feel more composed. With 24 of my 29 staff working remotely from all over the world, I’ve worked hard to create a virtual office we can all appreciate. Here are my tips for creating a company culture that extends across oceans. It’s not enough to just have an online presence – that presence has to be recognized as an authority in your field. Here are some tips to help you along. The fate of your email hinges on the quality of the subject line. Don’t try too hard to stand out in the inbox; instead, use a strategy of simplicity – this is what stands out in the stream of emails people receive every day. Are you spending way too much time creating content for your website, blog, social media or marketing campaigns? Here are four great content creation tools that can help you provide better, more engaging content in less time. Tip #23: Budget Your Social Media Marketing. Simon Slade, the CEO of SaleHoo, said that doing free SMM is a thing of the past. The conception and growth of my three businesses — SaleHoo, Affilorama and Doubledot Media Limited — has not been without its speed bumps. Use what I’ve learned to help you move forward by avoiding these four mistakes. The right subject line will get more of your emails opened and read. More emails opened and read will lead to more conversions for you. Simon Slade, CEO of SaleHoo, aptly notes "emails arrive chronologically, which is an inefficient and ineffective organization method. Pull assignments out of emails and add them to a task list." SaleHoo is meant to simplify that part of the online selling process by providing a directory where each supplier has been rigorously screened and verified as legitimate. Members can search the 1.5 million products by name, brand or category, sparing them all those hours of research I dealt with as a new seller. Simon had found his idea, but having just graduated Griffith University only two years prior, he knew he would need help bringing his business dream to life. He thought of Mark Ling, with whom he had played squash when they were teenagers. Simon knew Mark’s skillset would complement his own, and after discussing the concept with Mark, they eagerly decided to join forces. Instead, consider drop-shipping and wholesale directories. These middlemen already have relationships and contracts with suppliers in place. They will make your life a million times easier. I prefer SaleHoo because they have tons of recognizable products, both brand-name and generic. 9. When you personally know all of your company's Facebook followers. Simon Slade is an expert at dropshipping on eBay and has created SaleHoo to help new sellers navigate the world of finding reliable suppliers and creating success dropshipping businesses. "To be honest…" "Using this phrase implies that you weren't being honest before. Refrain from saying this so that everyone can assume that you're always being truthful." Work Email Is Dying. What's Next? "Emails arrive chronologically, an inefficient and ineffective organization method. Project management systems allow updates to be made in an organized manner, by project, and employees can review recent posts when they're ready to work on that project, rather than when their inbox dings, interrupting other work." The SaleHoo model is different than other drop shipping companies in that it doesn't offer products directly to its customers. Instead, it gives members access to a directory of more than 8,000 verified suppliers and drop shippers from more than 100 countries around the world. Simon Slade, chief executive and co-founder of SaleHoo, says loads of start-up bosses believe that you must be based in the U.S. to succeed in its saturated market. "Granted, it depends on how you define 'success', but I don't think this statement is completely true," Slade says. "Modern technology nearly eliminates geographic barriers, and if you're targeting the U.S., market proximity can help but it's not essential." Slade points out that many successful companies excel in that market without basing operations in the U.S.
Facebook is the most popular social media site, so customers expect businesses to maintain a presence on the platform. Thanks to Simon Slade, SaleHoo! Earning the coveted "authority site" status means ranking at the top of search engines, enjoying a large, loyal fan base, and of course prestige and recognition. People will seek out your website for expertise and industry insight. SaleHoo is a wholesale directory of 8,000 suppliers. Each one has undergone a rigorous screening process that is unmatched in the industry to ensure their authenticity as legitimate businesses. Prospective clients are inundated with advertising, making them experts at ignoring your flashing banner ad or simply using their DVR to fast-forward through your commercial. Because of this, content marketing has become more important than ever. How Top Online Retailers Sell Goods With No Inventory, No Storage and No Money! If you are willing to pay a bit extra, you can benefit from wholesale supplier directories, like SaleHoo, and source low-cost products to sell. This is a recommended strategy given supplier directories generally list legitimate suppliers and preclude unnecessary dealings with scammers. Maximize your productivity by tackling the worst job first. Simon Slade, CEO and co-founder of Affilorama and SaleHoo says, "With that exasperating chore out of the way, your mind will be free from the anxiety it brings, and it'll be easier to concentrate on other tasks." "Our SaleHoo blog covers sales tips, business and marketing advice, product suggestions, industry news, company news and more. In other words, the blog covers everything e-commerce professionals need to be successful…"
Facebook would love for you to buy advertising and exposure now that Like Gating isn't an option, but first consider the other more cost-effective alternatives: Although you can't mandate users like your Facebook page in exchange for an incentive anymore, you can still require them to join your mailing list in order to access the incentive. SaleHoo, an online wholesale directory of more than 8,000 prescreened suppliers (such as Gap and Playskool), offers a marketplace for those interested in serving as the "middleman" on eBay, meaning you act as the storefront selling wholesale products. The site explains all the details. SaleHoo: Another great piece of software that allows you to easily evaluate what's popular and what isn't through it's 'buzz' feature. It's a great way to get an idea of current marketing trends before you start selling on the platform. During his career Jason has worked with brands ranging from Affilorama, Traffic Travis, UPrinting, and SaleHoo. While Jason may not blog everyday, his personal marketing blog Kaiser The Sage is a great resource for marketers in the Philippines and abroad. Platforms like Doba and SaleHoo are increasingly automating the sourcing and selling process for many sellers, making it easy to find goods to sell across thousands of categories and manufacturers, and to get them onto eBay and even elsewhere easily. "I recommend new drop-shippers turn to SaleHoo for advice. SaleHoo offers over 50 free video lessons on how to get started, a blog providing the latest industry news and advice, and a community forum for sellers to ask and answer questions." 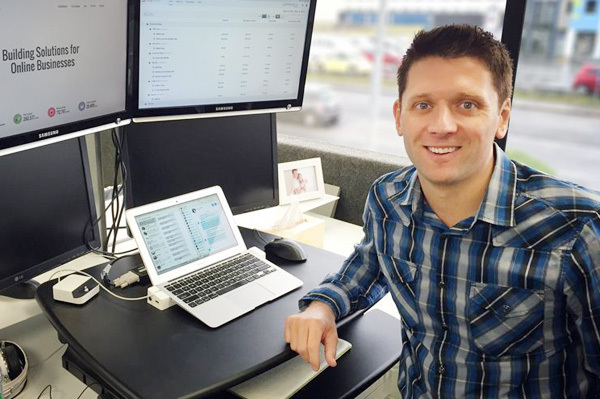 Simon Slade launched SaleHoo, an online wholesale directory of more than 1.6 million products and 50 free video lessons on e-commerce, with the goal of launching the leading destination for eBay sellers to research and source products. It was a big vision that required significant capital to get up and running. "Branding begins with developing a logo and consistent message that you can promote across your communication," says Simon Slade, CEO and co-founder of SaleHoo. "Be able to summarize your company goal in a few words and endorse that in everything your company does." "When seeking a job outside the U.S., make sure you understand the local customs of the application process, and write your curricula vitae in the country's native language," says Simon Slade, CEO and co-founder of SaleHoo, an online wholesale directory. "For example, New Zealand follows the British English style rather than the American version of English." 5 Essential Inbound Marketing Tactics - How Many Do You Do? Simon Says "Rinse and Repeat"
Ask Simon Slade why he has had such quick success in the web app development market and he'll recite his tried-and-true motto. It goes like this: "Build it, test it, learn from it, fix it. Then rinse and repeat as fast as possible!" How Do Employers Feel About Telecommuting? "...It doesn't matter if an employee is doing laundry in between writing blog posts or checking Facebook. All that matters is that my employees complete their work on time." "My goal is to empower, teach and provide the resources to help others be successful online. Whether they want to earn enough money to quit their current job or just earn some extra spending cash, SaleHoo can help them sell better online and Affilorama can teach them to affiliate market. Helping others achieve financial freedom is an extremely rewarding profession..."
SaleHoo discusses some of Amazon's customer service protocol that you should follow. Having a good customer service will guarantee that customers will come back to you for repeat business. "Web redesign doesn't have to be a time-consuming and expensive challenge," says Simon Slade, CEO and cofounder of SaleHoo, a platform for building your own online store and an online wholesale directory of over 8,000 prescreened suppliers. "For less than $500, you can make over your entire website using one of the following methods…"
Simon Slade-Who You Know or What You Know in Sales?